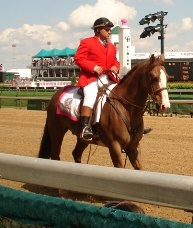 Dave Erb rode favored Needles to victory in the 1956 Kentucky Derby. Seven years later Braulio Baeza crossed the finish line first aboard Chateaugay, a 9-1 shot. 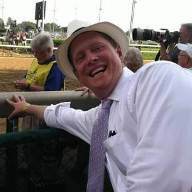 Both old riders are East Coast guys — Erb lives in Saratoga Springs, N.Y., and Baeza in Philadelphia — but they brought a little piece of Hollywood to the Derby folderol yesterday. 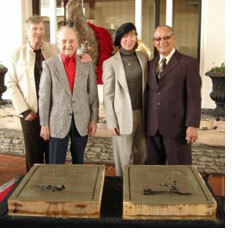 They became the 29th and 30th jockeys to put their handprints in cement for the “Gallop to Glory” exhibit at the entrance to the Galt House. “This is a dream, a great honor,” said Baeza, who also rode three Belmont Stakes winners. 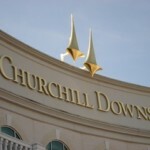 Needles won in dramatic fashion, coming from next-to-last and passing 15 horses in the final half-mile to beat Fabius and Bill Hartack by three-quarters of a length. 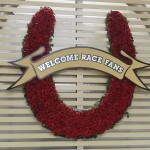 Why has the Derby held on to its place as the race? Erb rode for 21 years and trained for 28 more, piling up a lot of memories. What was his biggest moment other than the Derby? Yesterday’s ceremony also honored Ismael ‘Milo’ Valenzuela, who rode the Derby winners in 1958 (Tim Tam) and 1968 (Forward Pass, through the later disqualification of Dancer’s Image). He couldn’t be here, but tour organizer Jane Dempsey, who brought in the other riders, got Valenzuela’s handprints in cement and had them shipped from California by UPS. 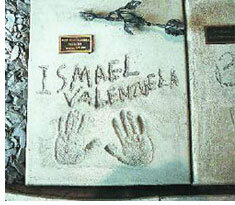 By the time Baeza and Erb applied their handprints and autographs to the cement, Valenzuela’s plaque — autographed with a nail — already was in place. He had crossed the finish line first again.